Want to create old film look? Enjoy creating videos and hunting down new ideas? Or maybe you always wanted to learn how to make a silent movie? If you’re inspired by masterpieces like Casablanca, Some Like it Hot, or Сitizen Kane, you can easily make your own film noir, or even a classic silent film. To create that old movie effect in a 21st century video, you don’t need to dig out your grandfather’s ancient camera, search for archival footage, or find an old black-and-white TV set. You can give any color video the monochrome treatment with a simple montage created with video editing software. 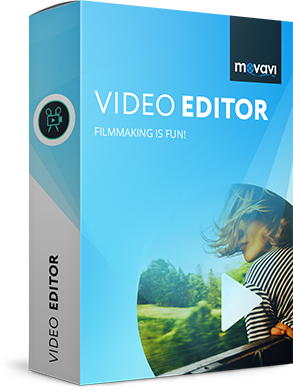 Just download the latest version of Movavi Video Editor and familiarize yourself with the guide below – you’ll be able to make retro videos and achieve that old-film look like a pro. For inspiration, take a look at how your video might appear after applying an old film overlay. 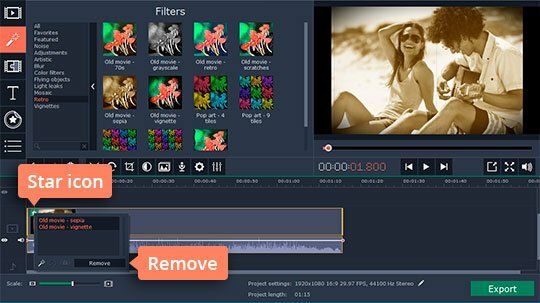 Download the video editing software. When the download is complete, launch the setup file and follow the directions on the screen to complete the installation. In just a few minutes, you’ll be able to start working on your video. Launch the program and choose Create project in full feature mode in the welcome window. 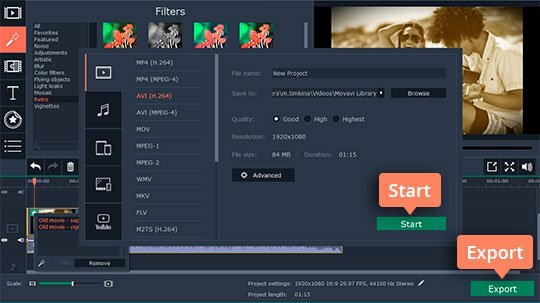 Before you can apply the vintage effect to your video, you’ll need to add your files to the program. To do this, click the Add Media Files button in the Import tab and choose the video you want to transform. You can also drag and drop the file from the folder into the working area. If you’re looking for new sources of retro videos and silent movie music, we can help there too. In the list on the left-hand side, select Sample video. The Download more! button will take you to the Videoblocks site, where you’ll find stock footage with film grain overlay and black and white effects – even countdown clips. Switch to the Filters tab and you’ll see a full list of all the available effects. Select the Retro section from the themed catalogue on the left. Here, you’ll find a group of effects called Old Movie. You can choose from several different styles: 70s, Grayscale, Retro, Scratches, Sepia, and Vignette. Just click the effect, and you’ll see how it will look like in the preview window on the right. 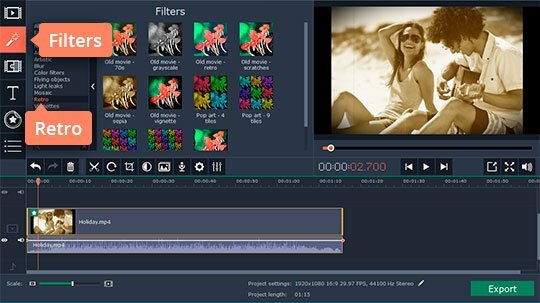 Note that you can also improve and change your videos using many other Video Editor effects; for more details, see our applying effects guide. To apply the effect you want, drag it onto the video clip on the timeline. To see a list of the effects you’ve applied, and to delete any unwanted ones, click the small star icon on the clip; select the effect(s) you want to get rid of and click Remove. Click the Export button and choose the appropriate tab in the dialogue box. To save the new clip as a video file to watch on your computer, select Save Video File. If you want to export it to your mobile device with all the optimal settings for that device, select Save For Devices. To share the video on YouTube, choose Upload online. 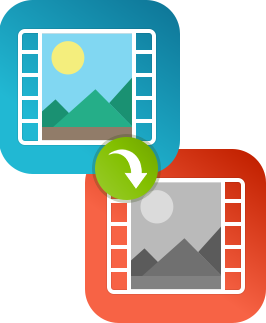 Now choose the format or preset you would like to use for your video, then type the filename, select the destination folder, and click Start. 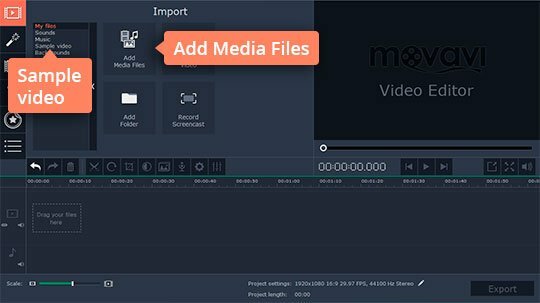 Movavi Video Editor is not just a silent movie maker app; it will help you create stylish retro videos and work with a broad range of editing techniques.